This post, written by Bruno Fonseca and Natalia Viana for Agência Pública, was originally published as a report entitled “Bomba brasileira na pele turca” (Turks Feel a Brazilian Bomb Firsthand) and is part of the special coverage #IndústriaBrasileiraDeArmas (Brazilian Weapons Industry) on the weapons lobby and industry in Brazil. The story will be published in a series of three articles on Global Voices Online. This is the first part of the series. In 2012, when the inscription “Made in Brazil” marked canisters of tear gas used against pro-democracy demonstrators in Bahrain, allegedly causing the death of more than a dozen people including a five-day-old baby [en], the Brazilian Ministry of Foreign Relations (Itamaraty) announced [en] that it would investigate whether there were any irregularities in the export of Brazilian tear gas. However, one year later, Itamaraty states that it is simply observing the case without conducting investigations or taking measures. O Itamaraty deve achar que somos ingênuos. Itamaraty must find us naive. 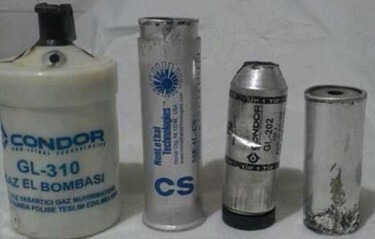 In the absence of restrictions [from the Brazilian government] on the exportation of non-lethal arms, the same tear gas, manufactured by the firm Condor SA in Rio de Janeiro, is now employed by the Turkish police in repressing the growing protests against the government of Recep Tayyip Erdogan, which have spread to more than 60 locations throughout the country, leaving hundreds wounded and estimates of 2,000 arrested. Um membro do nosso grupo encontrou a cápsula na noite de ontem (3 de junho) em Ankara. A member of our group found the canister last night (June 3) in Ankara. 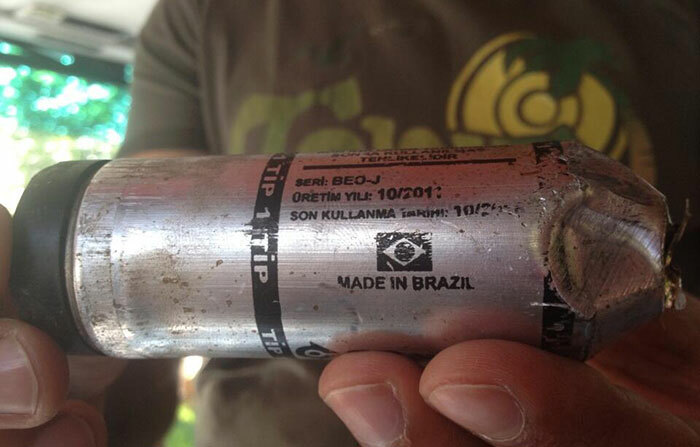 An American professor photographed one of the Brazilian tear gas projectiles used by Turkish police. Image: Suzette Grillot/Used under Creative Commons license. Naquele dia, havia apenas um grupo pequeno de ambientalistas. A polícia invadiu o parque às 5h da manhã enquanto essas pessoas dormiam nas barracas. Os policiais queimaram barracas e atacaram os manifestantes com gás lacrimogêneo. Os policiais deveriam atirar os projeteis de gás para cima, mas eles miram nas pessoas. Alguns perderam a visão por serem atingidos diretamente (pelos projeteis), outros são atingidos nos braços e pernas. Existem centenas de vídeos mostrando efeitos do gás: lágrimas, náusea, vômito, dificuldade em respirar. That day, there was just a small group of environmentalists. The police invaded the park at five in the morning while these people were sleeping in their tents. The police burned tents and attacked the protesters with tear gas. The police should have shot the gas canisters up, but they were aiming at people. Some lost their sight by being directly hit [by the canisters], others were hit in the arms or legs. There are hundreds of videos showing the effects of the gas: tears, nausea, vomiting, difficulty breathing. Estamos preocupados com relatos de uso excessivo de força por agentes legais contra manifestantes. We are concerned with reports of excessive use of force by law enforcement agents against the protesters. The shell photographed by the American Suzette Grillot is the remains of a long range tear gas canister (GL 202) produced by Condor, a leader in the production of this type of weapon in Latin America. The canister can reach an average distance of 120 meters (394 feet) and should be targeted before or above obstacles such as walls and barricades “in order to remove people and disperse groups of law-offenders,” according to the manufacturers own description. However, Condor states on its site that incorrect use of the canisters can cause serious damage to health — and even death. Another photo taken by demonstrators shows a random movement tear gas grenade (GL 310), also known as the “ballerina.” Upon impact with the ground, the bomb bounces back up moving in various directions, spreading the gas over a greater area and avoiding the possibility of the “target” throwing it back in the direction of the police force. The company’s site states that the grenade can ignite fires when it comes in contact with flammable materials. In a photo made public by demonstrators, the weapons GL 310 and Gl 202 from Condor are shown (1st and 3rd items from left to right). The 2nd weapon from the left is from Nonlethal Technologies, a company from the United States, which is the principal exporter of non-lethal weapons to Turkey, alongside the Brazilian Condor/Used under Creative Commons license.